We are finally on the path to home ownership. We have decided to move in with my parents so we can save up for my dream home. I know I could probably settle and get something now, but I am determined to fulfill this dream of mine. I have been looking at lots in Summit Park in Summit County. It is so pretty up there and right now land prices are insanely low. I have of course moved on to a new house plan. I like the porch and the open layout. 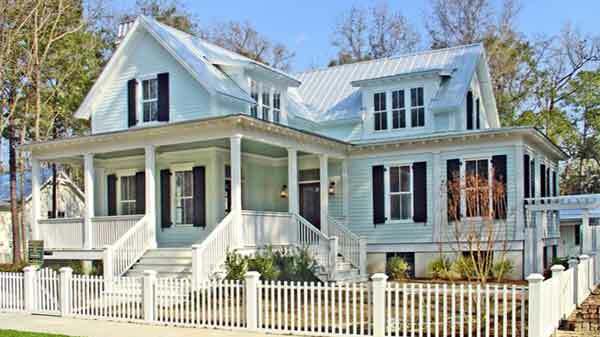 This house is from the Southern Living House Plans website. 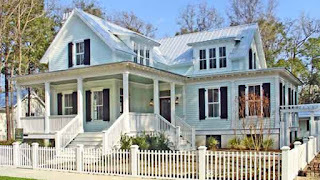 They have so many beautiful plans with big porches and open floorplans. It is amazing. The main floor has a great open floor plan with the Master as the only bedroom. This is something J wants is a Master on a separate floor from the kiddo's rooms. I also love the u shaped kitchen on the back of the house that looks out over the yard. Great for watching the kids play while I cook. The plan also has a screened porch, which I love. The only thing missing is a fireplace attached to the porch for those cold winters. But, I think that can be easily remedied. On the second floor there are two bedrooms, both with their own bath. E and N love that they would have their own bathrooms in this house. I think it will be a pain to clean, but maybe I'll be able to teach them cleanliness and responsibility for their own bathroom... I love the playroom on the second floor. It has a perfect spot for a hidden room (storage) and they could watch movies up there and keep all their "things" upstairs. What a wonderful plan! I am excited to start a new journey in life. Living in cramped living quarters (again, ah student years how I never wanted to revisit your small spaces...) will be hard, but I am so very determined to meet this life goal that I am ready for anything. I hope we learn to appreciate how much my parents are helping us out and think of that when we want to scream.